all this happiness: French Haircuts, Circus Girls. If there was an Anthropologie closer than 2000 km away I would surely be bankrupt. agree with emily! thank goodness there are none here. I'm positive Anthropologie would break me and I'd feel just as guilty, if I only had my own pennies to hand over. Thank you for your Anthro-like suggestive imagery--I'm going to make myself a pot of tea and indulge in a sweet treat because of your pretty picture. Oh my goodness, you have a Danish plate! My mom has cupboards full of the very same china that belonged to her grandmother. Isn't so delicately lovely? I walk in there and feel guilty for just looking. It's like my wallet gets smaller with me not even having to touch it. Oooh, your blog is wonderfully whimsical and I will be following from now on! Ohh I've been on the Anthropologie site and I'm so relieved they don't have one in Australia, if they did I would probably be working just to afford their stuff and still be in debt. that post you did on the fashion in Inglourious Basterds inspired me to have a go at recreating Shossana Dreyfus's look myself :) Like you I obsess over the fashion in my favorite films and then channel my favorite characters outfits! *sigh* I feel the same way about Anthro. Worse yet, I have a gift card I've been hoarding for a trip to my local store. So who knows what trouble my checkbook will get in to... lol! That last catalog really was amazing! Anthropologie really has a way of selling you the life you want to live. Gorgeous clothing, housewares, jewelry, soaps, etc...unfortunately, all my Anthro-purchases wind up becoming damaged or torn really quickly, really easily...not too affordable on my limited budget...such a shame b/c if the durability were there, I'd be bankrupt because of them! anthropologie is awesome! i got a tea cup from them (like the one in your header) for christmas and use it all the time! I agree. I just went by the Rockefeller center one yesterday and practically cried over all the things I can't afford in there! Ack, I know. Anthropologie is totally after my heart. I actually had to give in and buy a necklace on-sale the other day, even thought at 50% off it was still too expensive. They're stuff just basically represents my dream life. So fantastically said! I can't get enough of all their beautiful things, and I know that given half a chance I'd spend all my pennies, that's so bad! I just wanted to say, this is my first visit to your blog and I love it! Anthropologie, oh, how I love it, as well - always a pretty little thing to try on...and put back down, due to its pretty little price. However, I recently bought a book from Anthropologie that listed great dessert places in NYC - well, I have been to some of them and they were huge disappointments! -- for the better way to find out hidden girly gems and delicious desserts in NYC. I'll always love Anthropologie - just not its books! i totally agree and what a lovely photo! I was in the New York City Anthropologie a couple days ago and their window displays almost made me die of beautifulness. love anthropologie but too bad its so expensive. wonderful blog. Darling, Darling, this is lovely. I stumbled across your blog and fell in love. You are such a delight. Please visit my personal blog sometime, follow if you'd like. I love this - written beautifully! Totally agreed, glad there's no Anthropologie here, I would have minus money. I have always said I wanted my life to look like an Anthropologie store. 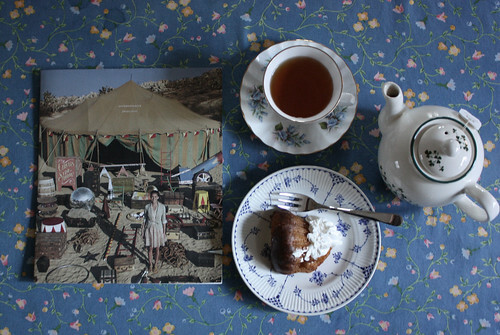 adorable little vignette - the perfect setting in which to savour a new magazine or catalog. anthropolgie is really amazing and i am so glad it's nowhere near me because it's always such a treat when i do get to visit.